Agrianita of Bogor Agricultural University (IPB) organized a special meeting for the transfer of authority or handed-over of the Management of Agrianita period of 2012-2017 to the new the Management of Agrianita period 2017-2022. The event was carried out at Wisma Landhuis of Campus IPB, Dramaga, Bogor, on 15 December 2017. Chairman Agrianita IPB period 2012-2017, Enny Rohaeni Herry Suhardiyanto, in her remarks reported that the Management of Agrianita has established various work programs that were well-implemented. "Let us improve and develop our Women Organization “Agrianita” that could address, with a united voice, issues of common concern to improve the dignity and prestige of women," she said. Enny Herry Suhardiyanto also expressed her gratitude for the cooperation and support given during her chairmanship, she requested the audiences and the university to accept her sincere apologies for the inconvenience they may have experienced due to the mismanagement in her term. I hope all newly appointed the board chairman and members are able to lead the organization in continued pursuit of its vision and mission, and its planned annual work programs. 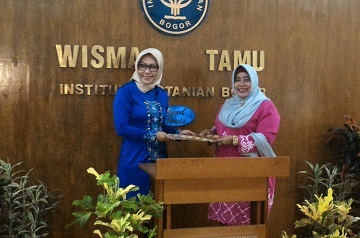 It is well-understood that Agrianita of Bogor Agricultural University has planned its work programs in such away to enable to this women organization of IPB to be useful not only for its members, but also the general public. Especially its vision to build the campus and its environment a place where every woman, man, and child leads a healthy, fulfilling life of self-reliance and dignity, so gender equality can be achieved," she added.